Although there is often many references to positive thinking as a broad concept, if we actually sit down and examine it, the words themselves mean little in application. Thinking positively does not really mean walking around with a smile on your face, having an optimistic outlook and believing all will turn out nicely in the end. But life, unfortunately, is often full of nasty little episodes and quite a few surprises, so when it comes to thinking positive often it is quite impossible to do for any extended period without having any solid reason to do so. And so this is usually where faith comes in. There can be no doubt that when it comes to magic you have to believe it will work. This is in much the same way that I discussed the placebo effect in another article. Yet, when it comes to Wiccan magic, this faith is not expected to be that of the blind variety and, for many people, that is where the whole concept of believing Wiccan spells will work becomes a whole lot less confusing. 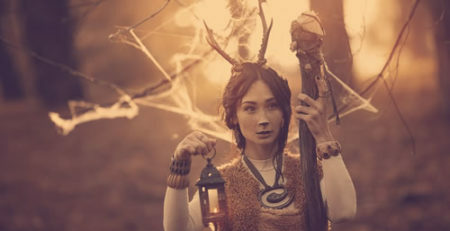 When you first look into Wicca as a form of worship what you tend to see first are references to, if not a strange form of worship, then certainly not one which is typical of mainstream religions. For a start there is no particular deity which is uniformly worshiped throughout the multitude of covens and, if you will, followers. You might also hear talk of the Goddess and God or Lord and Lady, which again would make you think there are two idols who are standardized throughout the religion but, once again, you would be wrong because most often they are peculiar to one particular coven. What Wicca actually asks is you have faith in is the natural world around you. It asks you to look at and see the power of nature, the complexity of it and the multitude of things we still do not understand about it even though we rely on it for our very existence. Wicca asks that you have faith in the strengths and spirits or energies which result in the world turning, the seasons changing, the tides ebbing and flowing and all the other magnificence which not only surrounds you but supports you. When you can genuinely appreciate in not only the majesty of nature but also the mysticism of it, then you can begin to have faith in the fact that it is forces such as these which will carry your spell to its target outcome and bear fruit. This, for many people, is a far simpler concept than being asked to believe in a god or goddess who has no apparent current connection with the ecology of our planet and nature specifically. If you now take the concept of thinking positively in connection with your spell manifesting, then we can see that it has a much stronger foundation. Your positivity is derived from the faith that something keeps our world turning and everything on our planet growing and productive. The weather changes, day turns into night and this does not require us to believe that it is true, because we know it is. What Wicca requires of us is that we have the faith this will continue, that we have faith in the nature spirits, elements, energies, forces or whatever name you wish to attribute to them. And, of course, we do have faith – few are the people who worry that tomorrow nature will suddenly let us down. Now you can face the world with positivity, because you are understanding where that optimism and general outlook comes from and it allows your spell to manifest with the best of intentions behind it.